Preheat the oven to 325 degrees. Prepare a muffin tin by lining the tray with 8-9 cupcake liners. Spray with nonstick spray and set aside. In a medium glass bowl combine granola, honey, and peanut butter with a wooden spoon until well combined. Spoon large spoonfuls of the granola mixture into the liners. Do not fill more than 1/3 full. Bake for 12 minutes. Take the tray out of the oven and let it sit for 10 minutes. Carefully remove the granola cups from the liners and place on a wire rack for an additional 10 minutes or until cooled completely. You can also place in the refrigerator to firm up more quickly. Beat eggs and granulated sugar with your mixer on medium high for 3 minutes. Meanwhile heat 1 cup heavy whipping cream in a small saucepan until just hot, not boiling. With mixer on low pour the hot cream into the egg mixture slowly until combined. Next, add the egg/cream mixture back into the saucepan and over low heat, stir for five minutes constantly until thickened. Do not boil. Remove from heat and stir in chocolate until melted. Cover and refrigerate for 2 hours, until chilled. When the mixture is completely chilled and firm, use your whisk attachment on your stand mixer to whip the remaining heavy cream until stiff peaks form. Remove chocolate from fridge and using the paddle attachment stir the whipped cream into the chocolate until incorporated and smooth. 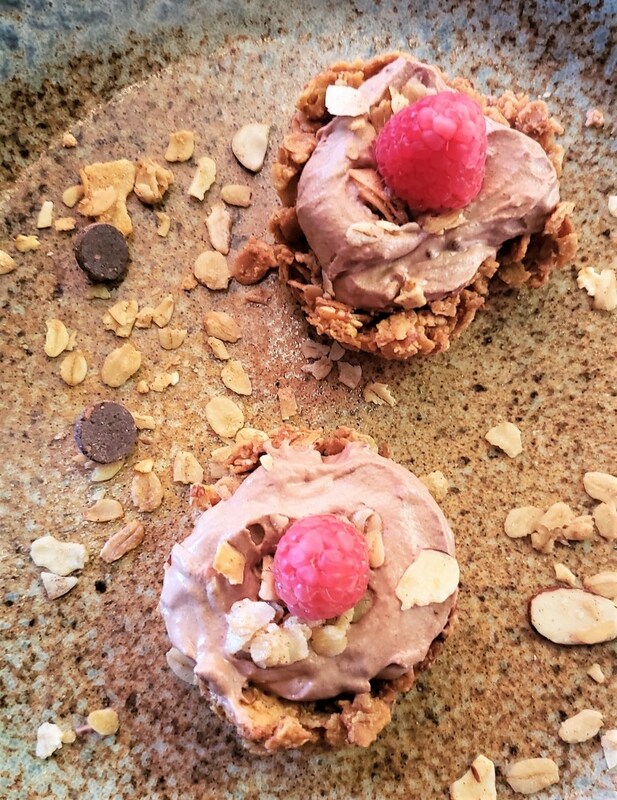 Place a granola cup on a plate and spoon mousse into the cup until you reach the desired amount. Sprinkle with remaining granola and top with fresh fruit. Enjoy!